Want to be a better leader? Want to motivate and engage your employees to great success? The old way of doing things relied on collecting data, running numbers, and looking at spreadsheets. Employers motivated employees with bonuses and financial perks, but few authentic interactions with management. As neuroscience enters the world of leadership development, research tells us that the basis of leadership might be different than we thought and we may need to change the way we lead. The brain is a social organ. That means that we are all born to connect. We cannot expect the best results if we see people as impersonal machines and employment as a place full of isolated tasks. How different types of tasks impact the brain and productivity. More effective leadership requires understanding emotions, using empathy, and building relationships. This type of social leadership can create higher confidence, improved relationships between employees, and increased productivity. A recent study done at Case Western Reserve University found a relationship between resonance and effective leadership. Being resonant means that a leader is empathetic and has a high emotional intelligence level. A dissonant style, on the other hand, is more authoritarian and objective. Using fMRI scans, researchers asked managers to think about experiences when a leader was resonant or dissonant. 14 regions of the brain responded when thinking of resonant leaders, while only six responded when thinking of dissonant leaders. In fact, 11 regions were deactivated when thinking of dissonant leaders. What this means is that resonant leaders activate attention, social awareness, and positive relationships in their employees, while dissonant leaders trigger negative emotions, disregard, limited attention, and decreased social awareness. Resonant leadership styles also help build trust through the release of oxytocin in their brains and the brains of others. When investigating the complex processes involved with leadership, many researchers study coherence. Coherence measures the coordinated activity of different areas of the brain in order to determine where there are connections. Studies have focused on the frontal cortex due to its role in emotional regulation and executive functioning, like goal-directed behavior. More specifically, the right frontal area of the brain is important to interpersonal communication and relationships. Coherence in this part of the brain is essential for social skills, emotional control, and self-awareness. These skills are the basis of being a resonant leader. One study in particular focused on vision statements, an aspect of leadership based on social emotional functioning in the right frontal area of the brain. During a qEEG assessment, which uses sensors to capture electrical activity in the brain, executives answered questions about their plans for the company and the future. They were also asked to create a vision statement. Coders analyzed the statements and scored them based on how much they focused on the self or on the team. They found that leaders who used more social language (we and us) in their vision statements were more likely to have higher coherence in the right frontal part of the brain than leaders with more self-language (I and me). Leaders who used more social language were also perceived by employees as being more inspirational and charismatic in their leadership styles. In effect, employees viewed leaders who had more right frontal coherence as being more resonant leaders due to the amount of social language they used. Research is ongoing, but there is some evidence that effective leaderships starts in the brain. We now know of some areas of the brain that can influence resonant leadership, but the question becomes how we use the information. The brain is plastic but it can be difficult to know what to do to influence certain pathways or areas of the brain. There is growing evidence that neurofeedback may be a way to do just that. Neurofeedback uses qEEG and a visual game-like component to activate a certain part of the brain. The game uses electrical readings from the qEEG to control an aspect of the game. If the correct area of the brain is activated, the game responds and the user is rewarded. If the incorrect area of the brain is activated, the game does not respond or there is some kind of penalty. Due to the plastic nature of the brain, after many sessions of neurofeedback, the brain begins to create new pathways that become automatic. This creates new habits and behaviors. There is the potential for neurofeedback to give leaders some help in forming new patterns and trying to be better leaders. For example, researchers from the study mentioned above asked a manager to participate in neurofeedback after the manager mentioned having anger management problems. With knowledge of what areas in the brain are useful in anger management, the neurofeedback therapist was able to help the manager activate the parts of the brain helpful in emotional regulation. After many sessions, he was able to reorganize his brain to create stronger pathways in the areas of his brain known to support emotional regulation. Neurofeedback has also helped people improve their focus and react better to stress. This may sound like science fiction. A computer alters the brain and the person is different, but that is not true. Neurofeedback cannot make someone a better leader. Its purpose is to help reorganize the brain to give someone the potential to be a better leader. It can make the brain more efficient and make it easier for us to behave in certain ways, if we choose to do so. With continued research, maybe more aspects of leadership will be found to have pathways in certain areas of the brain. Leadership training could become a personal brain-based approach, helping people find their struggles and unlock their potentials. While there is still a lot that is not known about the brain and how it can make us better leaders, the evidence continues to show that the basis of effective leadership is in the brain. 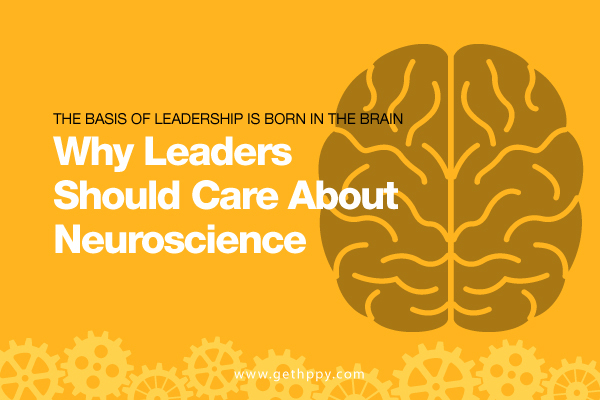 Neuroscience can help us all be better leaders.